Thus he began his career as an itinerant sanyasin. He was often seen in a meditative posture in the tranquil nooks on the mountain hills and seashores of the neighbouring places. By this time his mother died, and soon his father also passed away. He was now free from worldly ties. It was period of unending travels for him, a time to know first hand the life of the people. He spent his days in forests, caves, seashores, and in temples. When hungry, he would eat what was offered by strangers. During this period he stayed for a short while in the house of Perunnalli Krishnan Vaidyar, a renowned scholar and physician of Travancore, and studied some rare medical books written by him. It is believed that he first met the Sri Chattampi Swami here. Sri Chattampi Swami was then well advanced in spiritual matters and their meeting proved to be the beginning of a deep and intimate friendship. Later Nanoo Asan and Chattampi Swami travelled together to many places. Chattampi Swami who was a devotee of Lord Subramanya was also then known as Shanmukhadasan. He had written a number of books including Pracheena Malayalm (Ancient Malayalam) and was an advanced practitioner of yoga. Nanoo Asan was searching for a guru to teach him yoga. In 1884 Chattampi Swami took him to Thykkattu Ayyavu, a distinguished yoga guru of Trivandrum. Ayyavu Swami was a well-known instructor of yogic practices. Nanoo Asan accepted him as his guru in yoga. From this guru he learned ‘yogasanas’, practices like Nauli, Dhoudi, and Khadam and Khechari mudra.Sri Ayyavu Swami, a devotee of Lord Subramanya, taught Nanoo Asan the mantra for the worship of Lord Subramanya. This was around 1884 (1060). Ayyavu Swami was absolutely confident that Nanoo Asan had a great future. 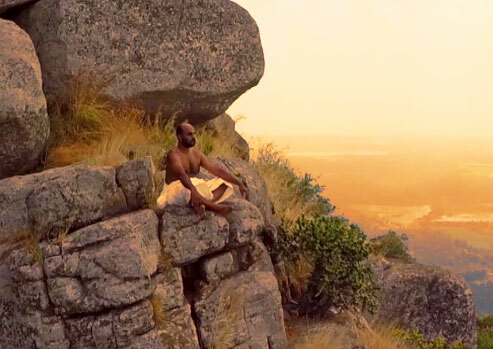 Soon Nanoo Asan went to the Maruthwamala mountain to practice yoga and meditation. He practised tapas, the art which brings the mind and the senses under control. It was at this time people began to call him Swami.